What exactly happens immediately after a flexor tendon injury? What does the term “no man´s land” in connection with flexor tendon surgery refer to? Do flexor tendon injuries always have to end up on the operating table? What happens during surgery on a flexor tendon? What makes a flexor tendon injury so complicated? A series of surrounding circumstances make flexor tendon injuries very complicated: For once flexor tendon injuries of the forearm or the hand typically occur close to important nerves and blood vessels, which many times get injured as well. 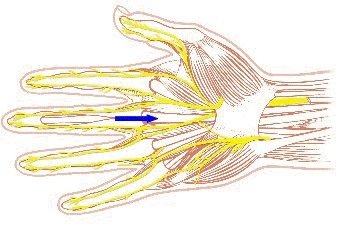 The structures pictured in yellow seen here represent the nerves of the hand, which run very closely to the flexor tendons. This close “neighborhood” explains why when a flexor tendon gets injured oftentimes the nerves (and blood vessels) are affected as well. When flexor tendons rupture they will pull very far apart, regardless of whether they ruptured in a finger or anywhere in a hand. The surgeon oftentimes is forced to elongate the primary wound in direction of the finger tips as well as in direction of the forearm in order to retrieve the tendon ends. The red arrow in the picture shows the beginning of a narrow tunnel system in the finger area. Within this narrow tunnel a reconstruction of flexor tendons is particularly difficult. One of the founding fathers of hand surgery (Sterling Bunnel) therefore established the rule that in this area no primary care should be provided to flexor tendons. Bunnel suggested performing a tendon transplant within this “no man´s land” not earlier than six weeks after the injury occurred. That is the origin of the term “no man´s land”. Today´s modern hand surgery however disposes of a different aftercare system as it was available to Bunnel at the time being. Today flexor tendons in this area are eligible for care even shortly after the injury occurred. The majority of all flexor tendon injuries have to undergo surgery. If the procedure remains undone there is a substantial risk for severe functionality losses. 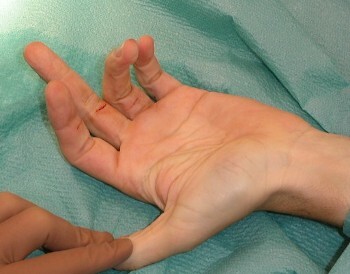 If both flexor tendons are ruptured, the finger can no longer be flexed. The image to the left shows that due to the severance of both flexor tendons in the thumb the middle finger can no longer be flexed. This should be a very convincing argument to opt for a surgical procedure with suture of the tendon ends. There are just a few situations which may lead the treating physician and the patient to a different conclusion. For instance an isolated severance of the superficialis tendon in one of the narrow tunnels may represent a significant effort when contemplating surgical care. In turn the loss of functionality may be fairly marginal. This could be one of the situations where a joint contemplation between the treating physician and the patient would make sense. Does the severed flexor tendon require immediate attention after the accident occurred? Ideally surgical intervention within six to eight hours after the accident occurred would be the best approach. As already mentioned the surgical procedure on a ruptured flexor tendon is not a small intervention. An experienced hand surgeon team should be performing the surgery. Should it not be possible to gain access to such team it would be better to have the wound sealed with simple sutures and to carry out the intervention a few days later when well-planned conditions for the surgery can be secured.A slightly delayed surgical intervention under the care of an experienced medical team and in a well-planned setting is definitely better than an emergency surgery performed by less qualified doctors. The identification of the tendon ends (this usually requires the elongation of the accident wound in both directions). The image below shows such a situation. The frontal particles of the flexor tendon can easily be spotted. The proximal ends of the flexor tendon have retreated far into the hand. 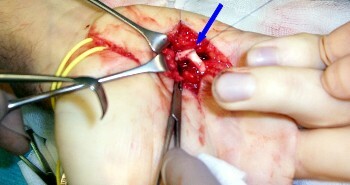 The blue arrow in the image shows such a tendon suture right before completion of the procedure.